It’s the 4th of October and I am at Camp 4 at 7400 metres (24300 feet) above sea level. It is getting dark and the wind is quickly gaining force. There are two other people in the tent with me but they are already asleep – it’s me who cannot close her eyes. I stare blankly at the tent fabric, flapping more and more violently by the minute, at my watch and then, finally – reluctantly, with something not unlike disgust – at my feet, which I can hardly feel. I reach for my toes, and my touch on them is barely perceptible – they are all cold. With my icy fingers I peel off the three layers of thick expedition socks I am wearing and point the light of the head lamp at my toes, white and going on pale blue. Next, I look at my watch again, which still stubbornly shows only 6 pm. My eyes suddenly fill with liquid warmth, and it begins slowly to glide down my face, disappearing between my dry, cracked lips. I think I’m crying – not because I may get frostbite and lose a toe or two, not because of the skull-splitting headache which has been killing me for several hours now, not because I am ridiculously cold but simply because there is nothing I can do about this whole situation – I will not reach the summit of Manaslu which I have come so close to. In a few minutes I turn my head lamp off and lie down between the two sleeping bodies in the tent to think about how I got to where I am now. It was sunny at Base Camp on the 13th of September. I was getting ready for the first rotation to Camp 1 at 5800 metres: trying the crampons on my brand new high-altitude boots, ‘decorating’ my climbing harness with spares and extras and airing my down suit and the sleeping bag I would leave at Camp 1 to later carry to higher camps. 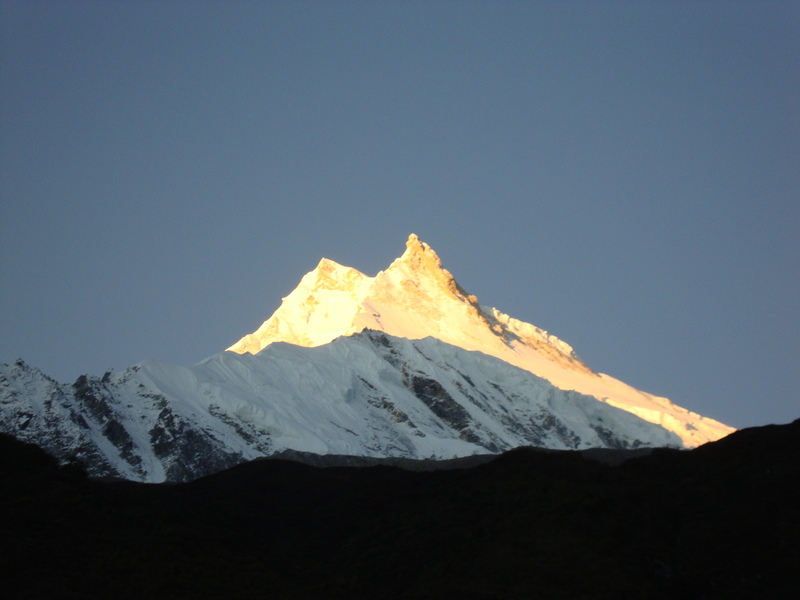 When on the next day the team began climbing, it quickly became apparent that nothing – not one step – would come easy on Manaslu to any of us. I started off by following the group’s fastest climber – a marathon runner – and our expedition leader but fell behind them when we hit the glacier after negotiating the first rocky section of the route to Camp 1. Clipped into a safety rope to avoid falling into one of the many crevasses which cut through the glacier, I moved slower by the minute under the angry sun. The day was windless and every breath of the thin mountain air I took felt deep, long, greedy and desperate. I was afraid to stop and take a sip of water – afraid I wouldn’t have the strength to keep going afterwards. Eventually, in just over three hours after leaving Base Camp, stumbling and gasping for breath, I arrived at Camp 1 – behind the expedition leader and the runner. Having dropped off our loads, we were sent directly back to Base Camp as the weather was changing and it was beginning to snow. Back at Base Camp I spent the evening thinking of how, even after a few more days of acclimatization, it would be almost impossible to breathe higher up on the mountain without supplemental oxygen. Yet, that is how I was planning to climb and, swallowing another pill of Diamox, I decided to stick to the plan. After a few more days at Base Camp the team was leaving for an acclimatization rotation: we would climb to Camp 1 and spend the night there after which we would ascend to Camp 2 at 6200 metres for another night and hike up to Camp 3 the next morning before descending to Base Camp with our acclimatization routine complete. Our bodies would then have gotten more or less prepared to function at high altitude – prepared enough to allow us to climb to 8160 metres, where the percentage of oxygen in the air is only about 1/3 of that at sea level. A good acclimatization strategy is the key to success of any mountaineering endeavour, especially, at such high altitude, and it is therefore very important to do a rotation like the one described before leaving for the summit. We left Base Camp for the rotation on the 17th of September. I only managed to make a few steps out of the camp before turning back. I was congested, disoriented, feverish and losing my equilibrium – I was falling ill at the worst time imaginable. The next two days tested my determination to the limit: speaking on the radio with our expedition leader, who was on the mountain with the rest of the team, I knew I had to somehow do the rotation if I wanted to join the others on the upcoming summit push. Thus, in spite of my sickness and the worsening weather conditions, I left for Camp 1 the day the rest of our group were returning to Base Camp. They looked exhausted and couldn’t stop talking about how painful the sleepless nights on the mountain had been and how the climb between camps 1 and 2 had been terribly steep and long. I listened to but tried to ignore their stories – all I wanted to do was get the rotation over and done with. I was accompanied by a climbing Sherpa who set the perfect pace for me, making the climb relatively easy. The night at Camp 1 wasn’t as bad as I’d expected since I was able to sleep and the climb up to Camp 2 the next day was perfectly manageable. 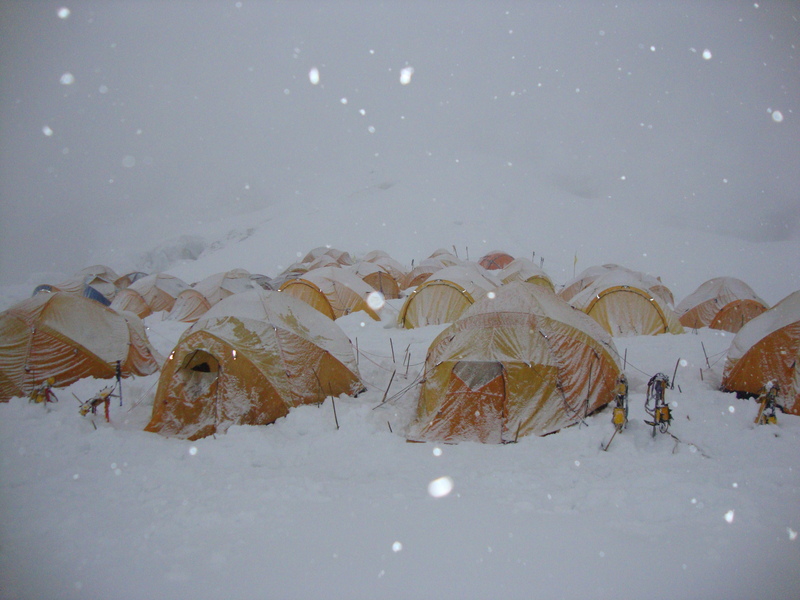 Due to heavy snowfall and the resulting avalanche danger, I couldn’t spend the night at Camp 2 and had to descend to Base Camp directly. I was feeling strong and optimistic on the way down, thinking to myself that I could, perhaps, climb Manaslu after all. 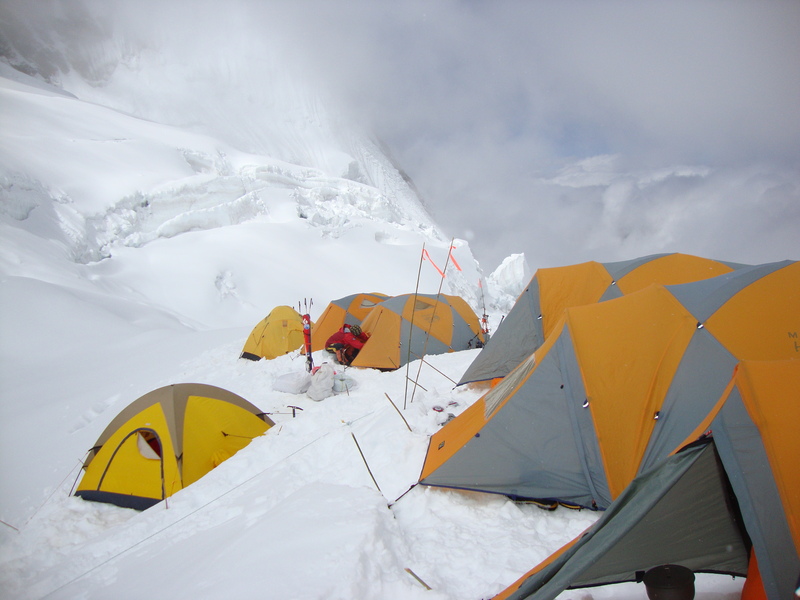 With the obligatory acclimatization routine out of the way, the whole team was now ready for the summit push. Our first attempt was cut short by a five-day snowstorm. It buried many teams’ high camps and all the fixed safety ropes on the mountain under metres of snow, creating a serious avalanche danger. After the storm was over and the snow had had a couple of days to consolidate, our patience paid off – the newest weather forecast was predicting a short weather window between the 4th and the 6th of October. 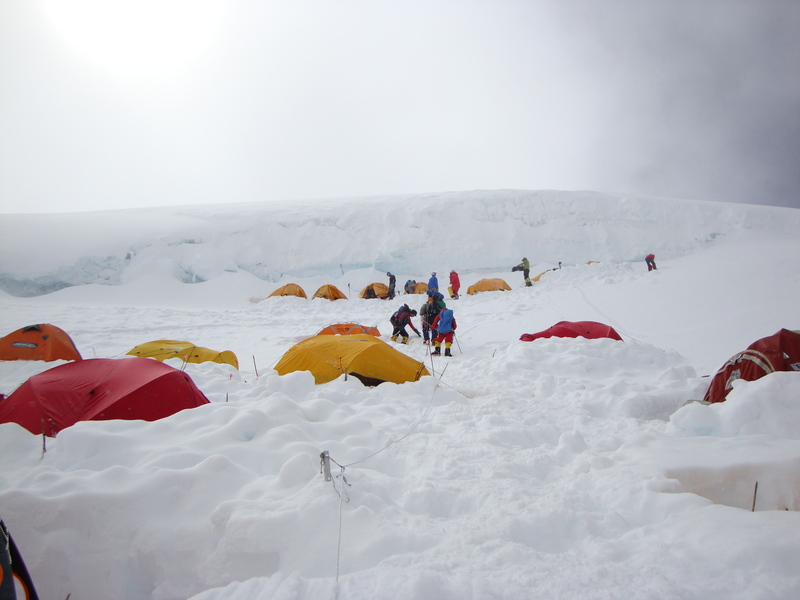 To make it by the 5th – our planned summit day – we would have to leave Base Camp on the 1st of October climbing to and sleeping at camps 1, 2, 3 and 4 before leaving for the summit in the first hours of the morning on the 5th. We would have to descend as low as possible on the mountain right after summiting to avoid being caught in the fast-approaching jet stream, scheduled to hit the mountain on the 6th or the 7th of October with its 120 mph winds. The summit push began on schedule and was going remarkably well for me. I was walking at a moderate pace to conserve my energy for the summit day, sleeping fairly well and even eating with appetite at high camps while many others couldn’t bear to look at food. The toughest section of the whole climb is the one between Camp 3 and Camp 4. 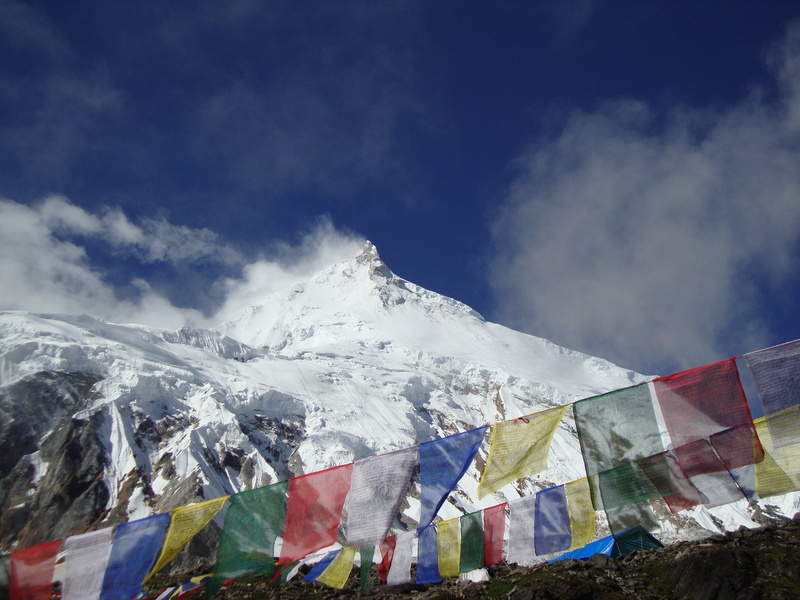 It lies between 6800 and 7400 metres and is the steepest and longest on the mountain which is why many climbers begin using supplemental oxygen as low as Camp 3 on Manaslu. It improves blood circulation at altitude thus keeping the climber warm and speeding her/his progress. My team mates would put their oxygen masks on at Camp 4 before leaving for the summit while I and the other woman on the team – the marathon runner – would go without all the way, facing an increased risk of frostbite, moving slower and getting tired faster than then our team mates on O2. Climbing towards Camp 4, I looked enviously at the climbers from other teams wearing oxygen masks: while I was climbing in a down suit without feeling too warm, most of them wore light jackets, and those who had been much slower than me before now passed me easily while I had to sit down to catch my breath. It is dark now, completely dark but it is not quiet. The wind is tearing at our tents with unsettling force and persistence so the Sherpas and climbers must talk at the top of their voices about delaying the departure for the summit. I sit up and reach for my feet to massage them but, unconvinced by my own effort, I soon stop and lie back down. At 3 am it is still too windy to leave, they say. I sit up again and sink my nails into my cadaverous feet – there is no pain or blood, just cold. My eyes are burnt so it really hurts when warm tears begin to flood them once again. It is 6 am and the wind is as strong as before but the sun is now shining and there is hope for warmth. I can hear my team mates getting ready. They’re going. Now. And I am not. I will not risk serious frostbite or the possibility of being dragged off the mountain by another climber or a Sherpa if at some point my legs, both broken just 8 months ago, fail me. ‘Mila?’ my climbing Sherpa calls as if from afar – he is sitting right next to me. 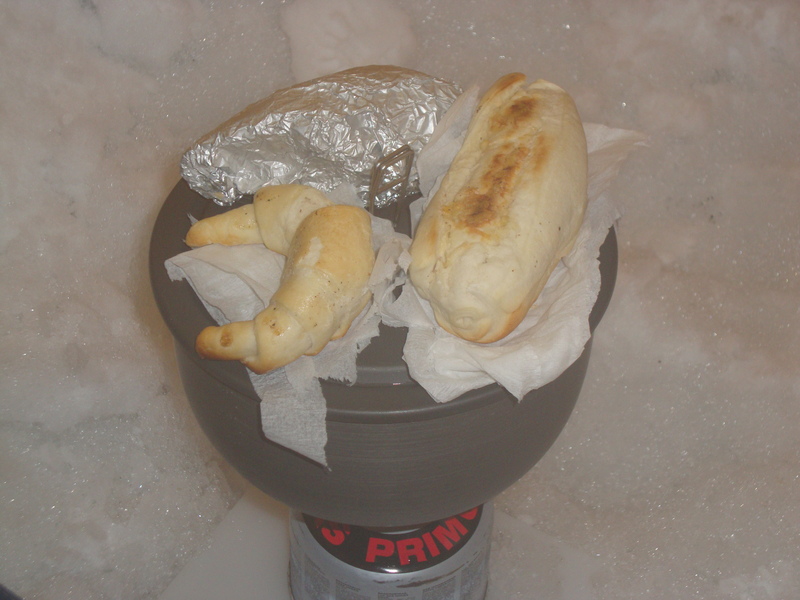 When he and my other tent mate are gone, I light the stove and resume my attempts at reviving my feet but the wind carries away all its warmth and I am left with nothing. I begin to pack. Another Sherpa from our expedition looks into the tent and tells me he’ll help me down. I crawl out of the tent into the wind which bites me on the face like a starved animal. My white fingers, now barely moving, stick to the iron crampons as I try, and try, and try to attach them to my boots. Finally, I am ready to go. I clip into the safety rope and start down towards Base Camp. The descent will take me just 6-7 hours. My decision to avoid certain frostbite and keep my toes will be called wise. A week after ‘the Descent’ I will still cry myself to sleep. Why? I hardly know. Well, this is more than a simple post, this is like traveling with you! Thanks for sharing your experience! Thank you for stopping by! I’m happy you liked the post! I must agree…I felt like I was there in the tent with you duirng the night…I have only felt that type of cold once or twice in my life and your words brought the feelings back again…an amazing post. Thank you! As always, you’re too kind! That night, though, truly was endless; I felt completely helpless against the cold, the slow flow of time, the inevitability of failure… I’ll never forget the feeling. Yall are crazy! I admire your courage for climbing so high. Hopefully I’ll follow your steps one day. You keep my dream alive! Thanks for your comment, Orel! It was easy climbing with good mountaineers and a great support team. Ultimately, getting to that altitude was just about putting one foot in front of the other repeatedly, stubbornly, over days and days. I have no doubt that you – or anyone determined enough – can do the same and enoy it, too, so keep that dream alive (and warm) ;)! I have been following you but don’t know jack about mountains . Miami is 4 feet above sea level. Talented people should not limit themselves to one pursuit. Little known for instance is Picasso’s pottery. It’s very flattering that you should think me talented, Carl! Thank you! I’ll follow your advice, then, and keep writing about all the many things I find interesting and beautiful.